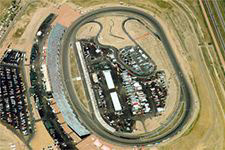 Pikes Peak International Raceway consists of a 1 mile D-shaped oval and a 1.3-mile road course with grandstand seating for over 42,000 fans. The lowest row of grandstand seating is elevated 16 feet above ground level, providing a complete view of the track from nearly every seat. PPIR is proud to host three major NASCAR races in 2000 -- the NASCAR Craftsman Truck Series event, set for May 20-21, and the NASCAR Busch Series Grand National Division NAPA AutoCare 250 and RE/MAX Challenge Series, NASCAR Touring Jensen 150 on July 21-22. Location: Pikes Peak International Raceway is located in Fountain, Col., 17 miles south of Colorado Springs on Interstate 25 at exit 122.